We added plenty of new books in our son’s second year but didn’t abandon any from year one. Enjoy! 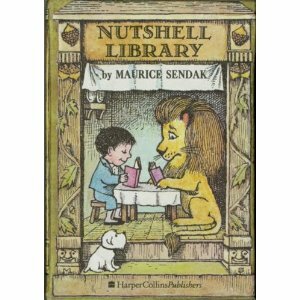 ~I had just put the finishing touches on this page when I learned the beloved children’s author, Maurice Sendak passed away. Many of his books are mentioned below. His work has been an inspiration for generations of young readers and it is my hope that he is in a better place with a piping hot bowl of chicken soup with rice. 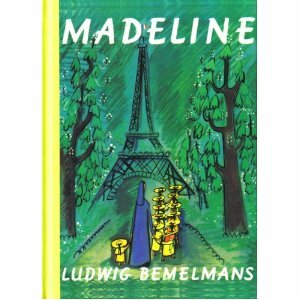 Oh, Madeline, Ludwig Bemelman’s classic. There is no better book really, in fact, my Mother gave me a copy when she found out I was pregnant. She used to read it to me as a little girl and I thought it might not have the same effect on a little boy, but it does. It’s the excitement of the story and the bravery of Madeline that appeals to kids, plus the illustrations of Paris are divine. We actually have three versions of Madeline in the house (I know-stop making fun of us), the first one is the board book version. It’s slightly truncated, which makes it just the right size for an altwo-year-oldr old to digest. We moved to the full version, though, only about a month later. We also bought it in French, but honestly, any self respecting French speaker would forbid me to ever read it out loud to anyone ever again, ever. Another French title we picked up is Tous les Loups by Bisinski & Sanders. Since it is comprised of only three French words per page, I can generally handle it; and since my maiden name is Wolf, the little man’s middle name is Wolf, and I wish I were French, well-I had to get it. The book has darling illustrations of all kinds of wolves, ranging from crazy to superhero. While I LOOOOOVED reading Goodnight Moon by Margaret Wise Brown to my son in French, one day it just suddenly disappeared. Gone. Never to be seen again. I’m not entirely sure who’s responsible, but whenever I ask my son what happened to the book, he gets an all-knowing look in his eye. 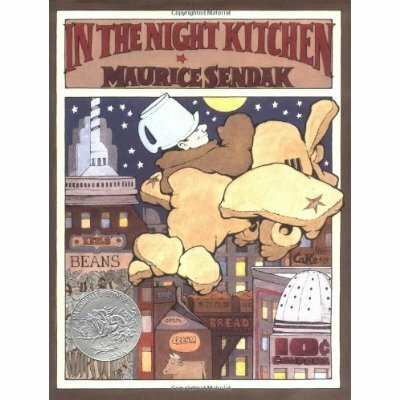 In the Night Kitchen by Maurice Sendak is the craziest book in town. A girlfriend gave it to me when I was pregnant and even though it was written in the seventies, I hadn’t heard of it. It has beautiful illustrations my son enjoys, but I haven’t wrapped my brain around the story yet. It has something to do with a boy named Mickey who finds milk in the Milky Way in an airplane made of dough and that’s why we have cake for breakfast. There you go. 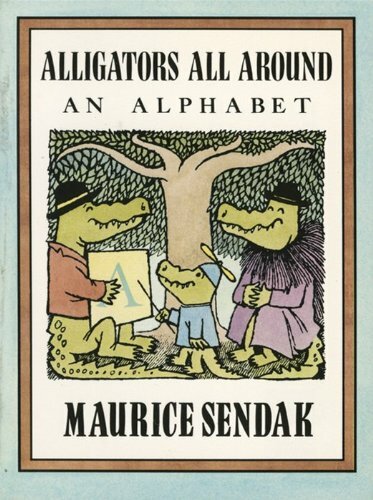 Mr. Sendak is also responsible for the amazing and equally wild Chicken Soup with Rice, and of course, Where the Wild Things Are. One Was Johnny-Johnny has a problem on his hands. One by one, too many things (animals/people) invade his home. He needs to solve this problem because Johnny lives by himself. How he does solve the problem might be too esoteric for a two-year-old to grasp, but it gets a giggle out of the grown-ups. 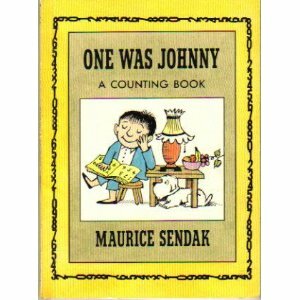 This is a great counting primer for kids. They get to count backward and forward and identify different animals. My son brings it to me out of nowhere to read to him. Alligators All Around-These alligators are pretty surly and kind of rude. They go through the entire alphabet acting out questionable behaviors. By the time we get to Z, we’ve turned it into a good exercise of how ‘not’ to behave. We also get to refresh our knowledge of uppercase letters and tackle those peskier lowercase ones too. Pierre-Pierre does not care. How he is taught to care is perhaps not for the weak at heart. While this morality tale makes a certain set giggle, it might be scary for some little kids. It has a happy ending, but just so you know, there is a hungry lion involved. 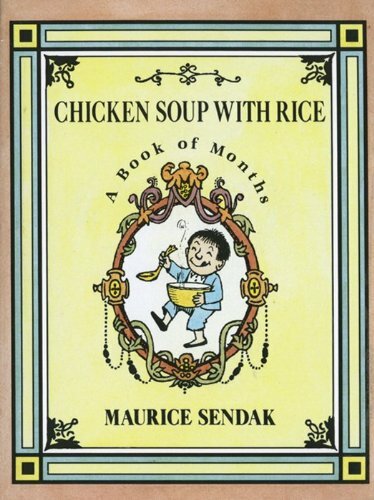 Chicken Soup With Rice-I don’t know why this book is great; it just is. On the surface, it sounds silly: a young boy loves chicken soup with rice so much, he has a poem for each month of the year about how he will eat it. Again, the illustrations are so detailed and wonderful I remember them from my own childhood as if my mother had read it to me yesterday. The book inspires a child’s imagination audibly by the rhyming poetry and visually by the wild depictions of the twelve months of the year. 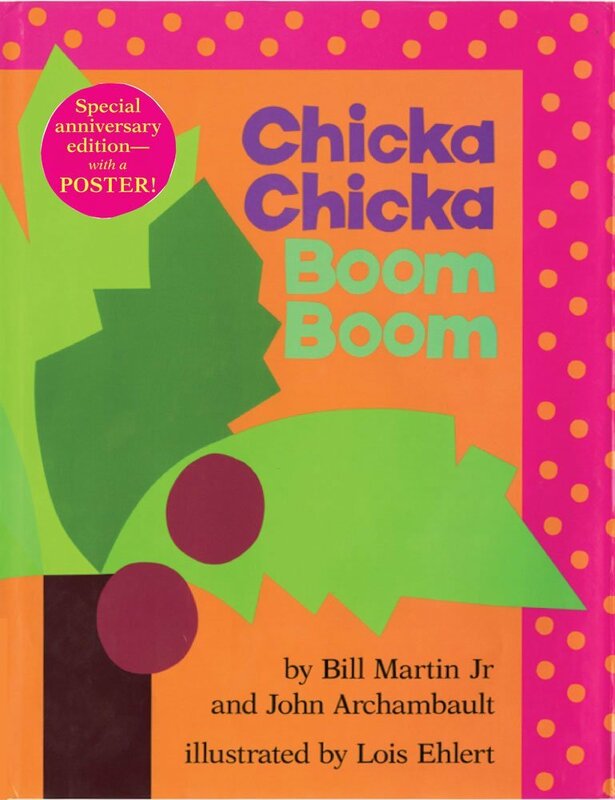 Chicka Chicka Boom Boom by Bill Martin Jr., John Archambault & Lois Ehlert. We have a blast with this book. All the little, lowercase alphabet children climb up the coconut tree but then LOOK OUT! Chicka Chicka Boom Boom. The rhythm is great. We giggle all the way through it. 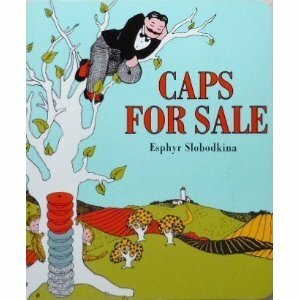 Caps for Sale by Esphyr Slobodkina stays with the monkey theme that seems to run through our house. A peddler with caps takes a little snooze under a tree only to wake up and find all of his caps have been stolen by monkeys. Eeek. How is he going to get them back? 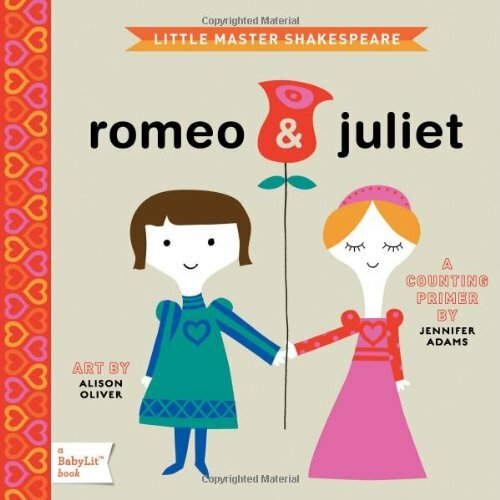 Romeo & Juliet by Jennifer Adams & Alison Oliver is fantastic. They have a series of BabyLit Board Books that include Alice in Wonderland, Jane Eyre, Pride and Prejudice and I hope many more to come. Romeo and Juliet is a counting primer, but I don’t want to give away the brilliant way they execute the story. The illustrations are terrific and my son, who’s into numbers and letters enjoys yelling them out as we go through the story. The illustrator, Alison Oliver has her own blog Sugar-worth checking out. She did the illustrations for CitiBabes down in SoHo. When they first opened, their aesthetic was really hip, but also sophisticated, a perfect combo for these books. 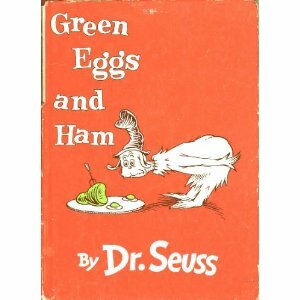 And finally, just like that, Green Eggs and Ham by Dr. Seuss got the green light. Instead of the usual shutdown after the first page, the little man seemed thoroughly engaged by the story of how Sam-I-Am tries to convince his friend to try something new. Now if Dr. Seuss had just written this book about lentils. 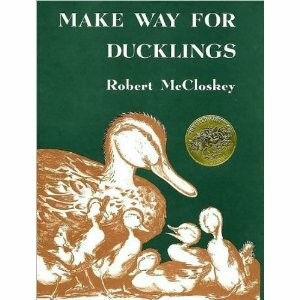 Make Way for Ducklings by Robert McCloskey is a classic. A young duck couple looks for a place to raise their ducklings around Boston. The mother duck grouses all the way through the book until she finds a sweet little island in the middle of the pond in Boston’s Public Garden. 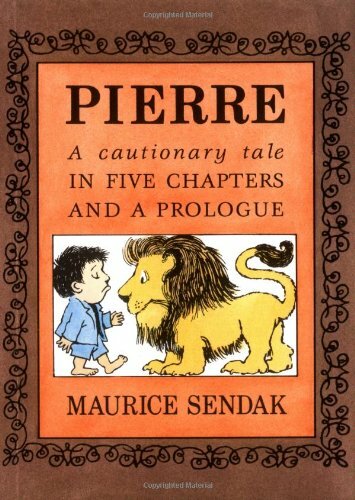 This book is a childhood favorite of mine. The illustrations depict the actual Public Garden and made it known to children all around the world. In the 1980s, a statue was erected in the garden to commemorate the author and all the little ducks. 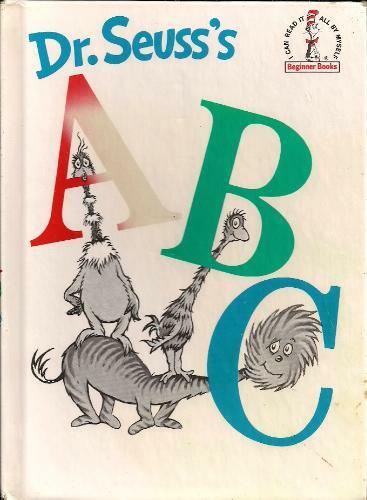 Dr. Seuss’s ABC is a long one, but we love it. Our son goes crazy for it. He yells out the letters each time I turn the page. He really responds to books with rhythms like Hands Hands Fingers Thumb, and Chicka Chicka Boom Boom. 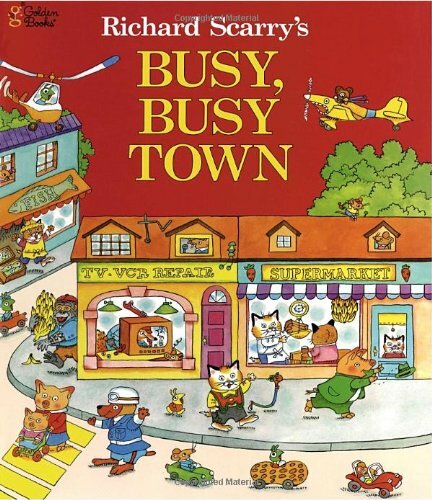 Busy Busy Town by Richard Scarry is another great ‘finding things’ book. That’s the term one of my girlfriends used for her time with Richard Scarry books as a little girl. Our son loves to hunt down colors, shapes, modes of transport and the like for hours. Oh, Curious George, what a fantastic book. We love our crazy friend (who our son calls ‘Geo’) and this is a long book with a lot going on. He loves the man with the Big Yellow Hat and he loves to see what kind of shenanigans George gets up to. 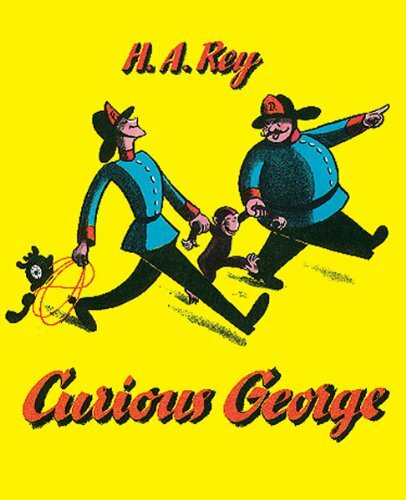 There is a whole WORLD of Curious George out there, but we stick with H. A. Ray’s original. We’ll see if and when we embark on any of George’s other adventures. 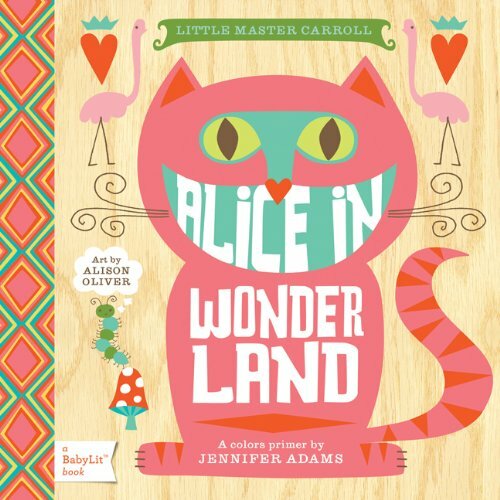 Alice in Wonderland is another BabyLit Board book and I love it just as much as I love their Romeo and Juliet. This one is a color primer with illustrations so modern and delightful I want to blow them up and hang them in our son’s room. He has advanced in his colors and numbers since reading these two books and it’ll be so much fun to move him into the actual literature one day. 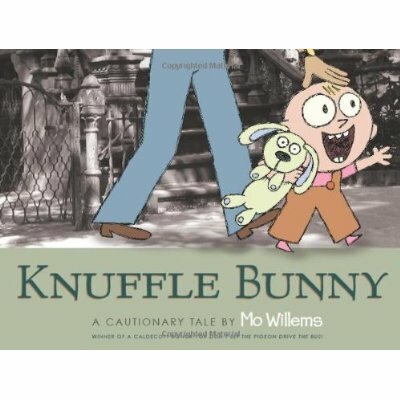 Knuffle Bunny: A Cautionary Tale by Mo Willems is a big hit with the little man (he’s not quite into Don’t Let the Pigeon Drive the Bus! yet). I think kids can feel the tension when Trixie can’t express her concerns in words to her Daddy yet. So when the story gets resolved you can see the relief on their faces! It’s so charming. 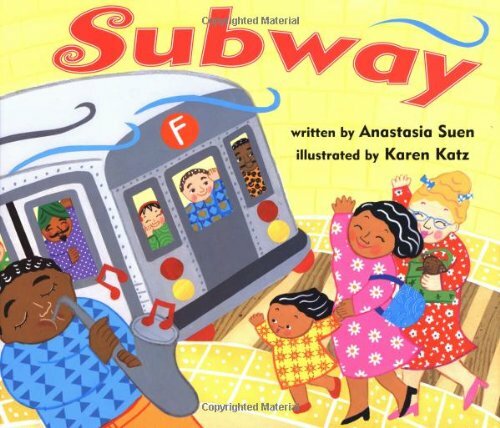 Whether you live in New York City or want to visit it one day (or any town with a metro system, for that matter), it’s fun to read about a fast, underground train ride. It’s also fun to find the little puppy illustrated on every page. I love this book. The little man is not so into it anymore. !! Its appeal lasted a week or two, now he’s done. Ok. Maybe he’ll come back to it. 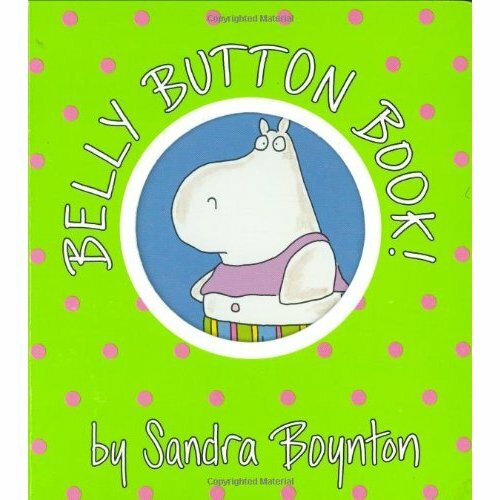 However, he does refer to his bellybutton as his Bee-bo, which he learned from the tiny Hippo in this book. 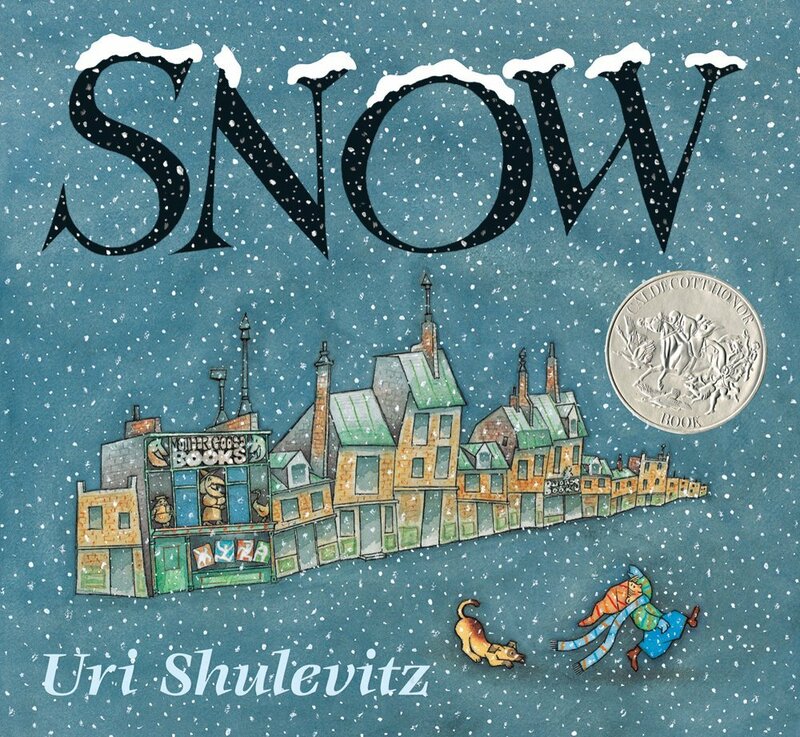 Snow by Uri Shulevitz seemed like a great book to get this winter as we haven’t had a single flake of snow. It seems like a history book that offers an explanation of a time when frozen water fell from the sky. The book has wonderful illustrations if you’re pining for a little winter. 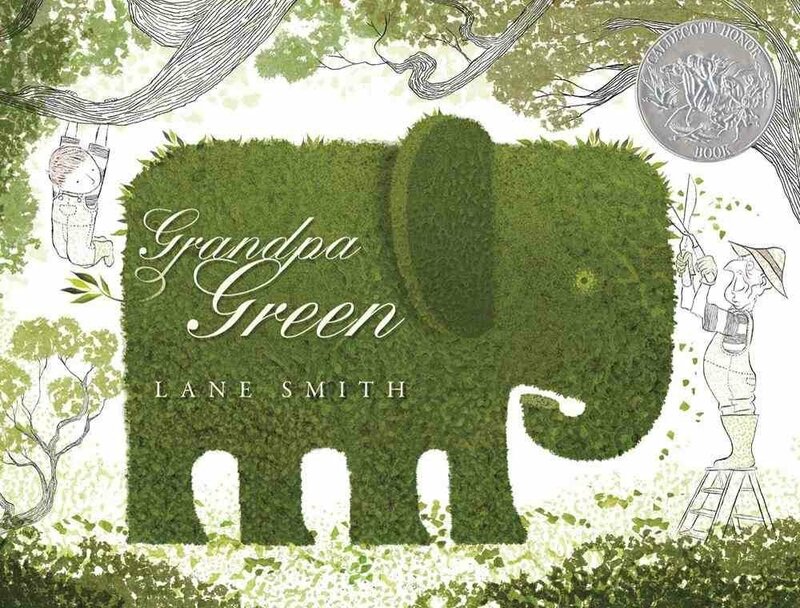 Grandpa Green by Lane Smith came out last year and made my husband and I tear up when we read it. It’s a beautiful story depicted through intricate illustrations of one great-grandpa’s garden. It’s a story that resonates with anyone as it illustrates the cycle of life, but it also holds special meaning for a specific generation. 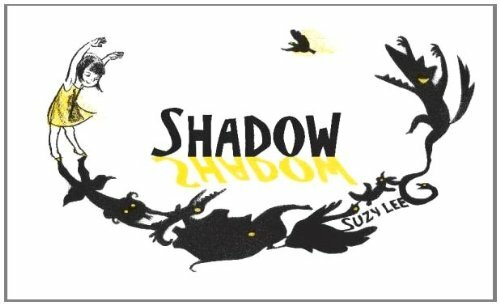 Shadow by Suzy Lee has no words; just a little girl in her basement playing alone (or is she?) with her shadow. It’s a wonderful book for kids because it is completely non-linear, they can let their imaginations run wild along with the illustrations. 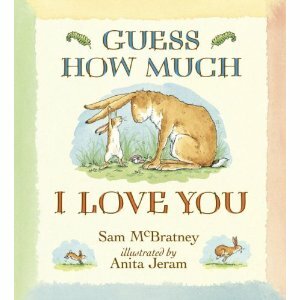 Guess How Much I Love You by Sam McBratney & Anita Jeram. If you want to see your little one try to measure out the distance with his arms, legs, hands, feet, ears of how much he loves you or how much you love him-this book is for you. I’ve heard people say for years, ‘I love you to the moon and back again.’ I didn’t know this book might be why. 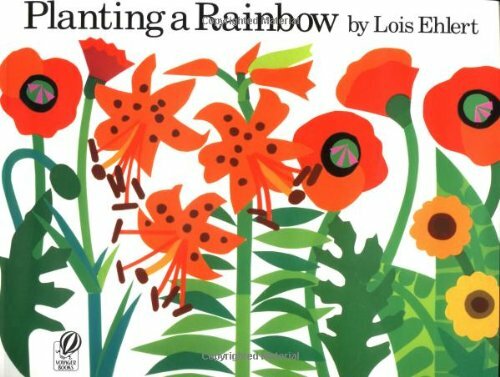 Planting a Rainbow by Lois Ehlert explains in a simple, colorful way, what it means to plant seeds in the winter and wait for their flowers to bloom in the summer. This book is essential for me as an urban parent. It serves as a reminder that all produce and flowers don’t just magically appear. We picked up Andy Warhol’s Colors by Susan Rubin at the National Gallery in Washington D.C. It’s a fantastic color primer, but also an introduction to one of the world’s most iconic artists. Andy Warhol’s paintings are bold, simplistic and intricate all at the same time. The book is full of monkeys, cows, bugs, lions, fish, cats and butterflies. A nightly go-to book for the little guy for the better part of the year. Don’t Let the Pigeon Drive the Bus! 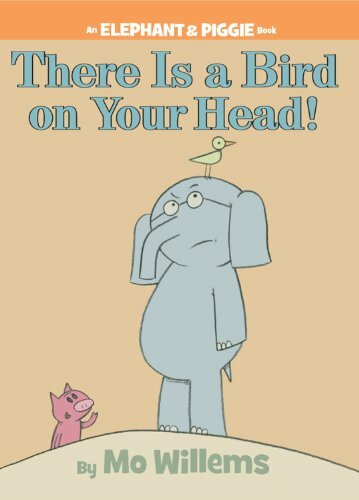 by Mo Willems is now a classic. 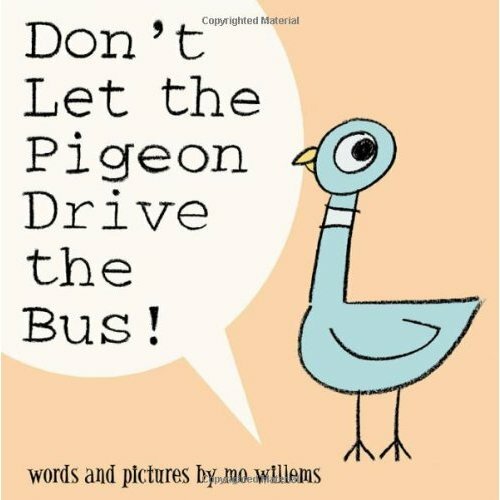 The Pigeon wants to drive the bus, your little one has the choice to tell him yes or no: pretty deep right? It starts kids thinking about peer pressure. It (maybe, hopefully) starts to make them understand why we have to say no to them sometimes. Oh that Mo Willems, I just want to squeeze him. There Is a Bird On Your Head! (An Elephant and Piggie Book) by Mo Willems is a series of books I thought might be a little too advanced for my twenty-one-month-old, but he LOVES this book. One of the great things about Mo Willems’ illustrations is their depiction of emotions. I can see my son experience the arc of the story. He is truly concerned for the discomfort Elephant experiences because he has a bird on his head. He’s then visibly relieved when the situation is resolved. It’s SO cute I can hardly stand it.